Meeting & connecting with a Dog is one of life’s absolute joys – for kids & adults of all ages. 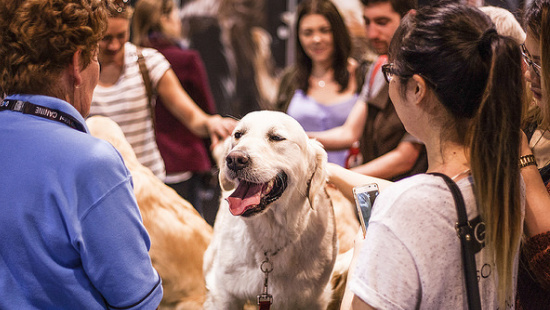 It releases happy endorphins and never fails to put a smile on our face, so the Pat-A-Pooch feature was once again one of the most popular attractions at the Dog Lovers Show. Visitors were able to interact with a wide range of Dog breeds of all shapes and sizes with a handler on-hand at all times providing trusted, reliable information on each pooch. This feature presented a rare opportunity for kids (and adults) to get up close and personal with a wide range of Dogs with valuable information to help them make more informed decision on selecting the right breed for their lifestyle and home, as well as taking a much deserved break from the day. Pat-A-Pooch worked in conjunction with the Breed Showcase and Adoption Zone features in helping to provide valuable education on a wide range of Dogs.